Discussion in 'Colored Gemstones' started by aac2013, Dec 26, 2018. I finally purchased a ruby just in time to have my own bit of Christmas red for the holiday. I have looked for a ruby for quite some time. This one is 4.02 carats and GRS graded as vivid red pigeons blood (though she really is a chameleon). Sometimes she displays bright red and other times a bit of purple comes through. She is from a newer mine in Mozambique and is very clean clarity wise. As I had to compromise somewhere, she is heated (GRS [H]) but no other treatments. hmr_mama, MeowMeow, ratatat and 32 others like this. So beautiful! Who made your setting? What a ring! It's gorgeous! The ruby is luscious. Congratulations! Very nice! Congrats! It's so lovely... So clear! What a stunning ruby! Wear her in good health. What luscious color in that ruby and such a elegant design to show it off. Really fabulous! Congrats on your beautiful ring! Thanks! I will ask the jeweler. He already had it set when I purchased the ring. It is platinum with an 18k basket for the ruby. The sides are epaulet cuts which don’t really show that well in the pics but I do love them in real life. Acinom and strawrose like this. What a gorgeous ring! I love the sidestones with your ruby! I love the ring. The ruby is very large so you must be very happy with the finger coverage. kindred and aac2013 like this. Perfection! Stunning! I want to borrow it! Wow! This is totally gorgeous- my goodness, happy holidays for real! Congratulations on an amazing ring. That’s a pretty decent Christmas present congratulations, it looks splendid! Thanks! I do love the coverage. I would have loved to reach the 5 carat mark but it was an unrealistic jump in price for me. Thanks to all for the compliments. I love being part of such a lovely supportive gem/jewelry community! VividRed and InsecureSweetGirl like this. Beautiful ring! The ruby is impressive and I love the epaulets. They look icy white and make a lovely contrast for the ruby. Well done! What a luxurious ring! 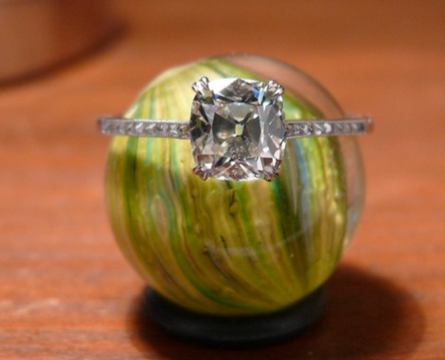 Both the stone and the setting are top notch. So happy for you that you have found such an amazing ring. Great finger coverage too! Love!!! Enjoy your beautiful ring. What a beautiful ring, I love the side stones too! I apologize if there are errors in this post....I am typing in the blind because my eyeballs just fell out of head when I looked at that gorgeous and amazing ruby ring. Holy moly! The green eyed monster is alive and well in Cleveland. That thing is REGAL! WOW! Lykame, aac2013 and 711heather like this. Woweeeee! You know, that is like my perfect colour ruby; I know a lot of people dig for stop-light red, but I love these slightly darker blood coloured rubies on the purple (but not purple) side rather than anything even close to pink or orange. Don't suppose you have a video for us to lust over too? How did you find the ruby? And if so, do they have an online shop? aac2013 and lmyracle like this.